Nathan writes: According to your teachings, it is demeaning. You place the emotional lower in spiritual evolution than the mental and that the mental should guide the emotional, so by saying that women are more involved in the emotional and that men are more involved in the mental you are effectively saying that women are generally the lesser of the two sexes and that things are best when men are guiding women the most. JJ First, it is an obviously fact, almost universally acknowledged by both men and woman, that females are more in touch with their feeling nature than men. One of the common complaints among females about males is that they do not communicate their feelings well. It is true that the plane of the mind is above the emotional but few people either male or female function on it. When we speak generically about the mind as far as men being polarized in it we speak of the mind as commonly understood, not esoterically understood. The mind as commonly understood means focusing on brain activity and the highest reason available to consciousness. To say that a person is polarized in the emotional nature is no more demeaning than saying that a football player like Tom Brady is polarized, or has the majority of his focus, on the physical plane where football is played. Because his focus is on the physical or the lowest of the planes does not mean the guy is not evolved. On the other hand, his business agent who may be lesser evolved than him is probably polarized on the mental side. Now Tom uses his mind when he makes plays and certainly shows his emotions when he causes a turnover but his attention overall has to focus on the physical game. That is not demeaning but has brought him great glory. A female because of her birth is pulled toward the emotional side but has a brain and mind with as much ability as a male and can use it to her heart’s content whenever she wants to focus on it. It’s a little like this. If you are in a rowboat in a flowing stream and can go either direction which one are you likely to choose – the upstream or downstream? Downstream is much easier so most will choose that, but a few will struggle and decide to go upstream for the challenge. For males the flow of the stream is reversed. A male-female team are powerful together when they rely on each other to move them one direction or the other according to their inherent natures. Gays are another matter. They are only slightly polarized so they are like a person rowing in a lake where there is little push from the water. Less than 10% of humanity can function on the plane of the mind and far less than 1% have mastered it. A female can be polarized in the emotional nature yet function on the plane of the mind which is polarized in the male. The nest plane up is the intuitive (buddhic) and that is higher than the mental plane and polarized in the female energy. Those who seek to function on this plane must focus on the female/receiving side to bring down concepts from the higher planes. Both males and females must apply the same principles. Nathan: You also say that the Left is composed mostly of femininity. How is that not demeaning towards women? JJ It is a proven fact that the females as a whole do lean left. I have you the ironclad evidence on this when I posted the chapter from my book. It is your judgment, not mine that it is demeaning. You’re basically saying reality is demeaning here. Both sides have their flaws and must check themselves from going too far in either energy. There are also cycles involved. There are times when it is good to have the feeling/creative side dominate and other times the mental/reasoning. Right now with the tremendous overspending problem an extra dose of reason in politics would come in handy. Many politicians feel we need to spend more money on helping people but the mind must step in and make these expenditures fit into a budget. You’ll notice that the receivers of extra worldly information are mostly women whether they be lower direct voice channelers or higher initiatives like AAB, HBP, Helena Roerich and Helen Schucman. Receiving is going with the current for females but against the current for the males. That’s why we do not like to ask for directions. LWK On the other hand, when Isaac Newton supposedly sets under an apple tree and gets hit on the head, is that a metaphor of him pulling pure knowledge _down_ from a higher plane? JJ A great mind like Newton used the intuition but went even beyond it to the Atmic, the realm of direct contact with ideas, which shifts again to the male polarization. As evidence of this you’ll note that men place many more patents than females. Planes 1, 3 and 5 are dominated by male energy and 2, 4 and 6 by female. Plane seven, the divine is very slightly male. This slight imbalance is essential for the creation of form. To get an idea of how slight it is compare the amount of empty space in the universe to the places where physical matter exists. LWK indicated I was not consistent in my use of the word “intuition” so I thought I would add a few words of clarification to the many I have already written. There are two basic hurdles that must be overcome for the esoteric student. (1) Average people use the word to convey a wide variety of meanings. (2) The common definitions differ significantly from the metaphysical one, as the common one is much broader. (A) An ability to know or understand something through your feelings, instead of by considering facts or evidence more… (B) Instinctive knowing (without the use of rational processes) (C) An impression that something might be the case. For our studies, forget about intuition as applied to getting something from emotional feelings, lower psychism or instinct. The one thing the student must accomplish to use true intuition is to penetrate the intuitive or Buddhic plane with his consciousness. This taps in to still higher planes where all true principles as well as the seed ideas behind all creation lie. I have said that intuition brings a flashing forth within the mind that leads to greater understanding, especially concerning principles, but the application is broader than this. Contact with the intuitive plane can lead to higher psychism such as conscious channeling. With lower psychism the medium goes into a trance and is not conscious of what is given out in the trance state. This takes place through the astral body and the data is often not reliable. The conscious channeler touches the intuitive plane with the higher mind and gathers true impressions or receives by mental telepathy from either her higher self or higher lives. Thus Alice A. Bailey used intuitive abilities to receive from DK though it might be more accurate to call the process telepathy rather than applying intuition. The most common form of true intuition involves that flashing forth in the mind where understanding is enhanced. When one achieves some mastery of the intuitive plane he then seeks to access the Atmic plane where the seed ideas of creation reside. Once this is achieved he not only receives through the intuition but becomes a Knower by achieving direct access to this plane. JJ No. Many inventions are created because of a need that is mentally deduced and is a logical sequence of need. It is the inventions that are a leap that tap into the Atmic. To understand let us look at the difference between a couple of inventions by Tesla and Edison. Edison’s most famous invention was the light bulb. The idea of creating a light bulb, I’m sure occurred to thousands of people before it materialized but no one knew how to put the ingredients together, including Edison. What made Edison different was he had the resources and determination to make the 10,000 logical experiments necessary to finally achieve success. My best guess concerning Edison is this. The idea of creating a light bulb was a logical deduction created by his rational mind. However, after much contemplation, he tapped into the intuitive plane and saw that the creation had a true reality on a higher plane. This gave him faith and a knowing that a light bulb could be materialized on the physical plane. On the other hand, Tesla’s most famous invention was the Tesla Coil. This was an entirely different animal than the light bulb. It was a natural and logical thing for many people to dream of creating a light bulb but few if any daydreamed about creating a coil that could transfer energy as did this and even led to the invention of the radio. Many of Tesla’s inventions give evidence that he directly tapped into the Atmic plane and understood how the ideas worked from that point. Edison received intuitively and conjured mentally and had to figure out on the mental plane how to make the ideas work. There is a similar difference between Bill Gates and Steve Jobs. Gates receives an inner confirmation of innovations that can be accomplished and he proceeds mentally. Jobs saw a vision from a higher plane and saw ideas that were beyond the regular reasoning process. Now Jobs was not as evolved as Tesla, but the difference between him and Gates is quite similar to Edison and Tesla. JJ See above. Some have, some have not. Dan 3) I think you have said that mastery of the planes is progressive, so that one masters first the mental, then the intuitive, and then the atmic but that one may get “flashes” of contact with the next one or two “up” without mastery, is that correct? JJ Yes, it is progressive but with gaps as mentioned by Judy. A common example of these gaps is the intelligent nerd that so many movies are made of. The nerd character is very smart, gets all A’s, is a computer whiz etc. On the other hand, his emotional intelligence is very low and he does not understand that world. The third plane is thus more developed than his second and he must eventually spend time developing this before he can move on to higher things. 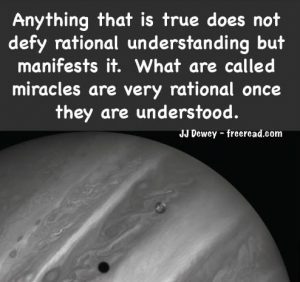 lwk A classic example of your “waffling” on your definition of “intuition.” First you say that AAB used “intuitive abilities” but then say to the effect that, “Well no, it was actually telepathy” which you say is a more “accurate” description. JJ Let me put it this way. There is no telepathy without the attainment of the intuition, but one can be intuitive and not have the ability to be telepathic. The intuition opens the door to a large number of abilities, similar to soul contact, for one needs a degree of soul contact to access the intuitive plane. A true telepathic person thus uses the intuition to access an evolved mind. He receives these mental concepts in a similar manner to the receiving of flashes of understanding from the mind of God. JJ You’d better hope this isn’t true because you are an idea in the mind of God and if you had a beginning then you will have an end. Ideas have no beginning or end. Will there ever be a time when the idea of a light bulb cannot exist? No. And this means that it neither had a beginning. What does have a beginning is the incarnation of ideas. These have both a beginning and end. I have often given the example of a melody to illustrate this. The ingredients for the song Yesterday have always existed in the Eternal Now. Lennon and McCartney brought it into incarnation. Eventually all that creates its incarnation will be destroyed and it will not exist in the physical plane. But then eventually there will be new creations and the song will incarnate again but with an altered arrangement. This principle also applies to us as eternal beings. A while back Dean referenced an interesting video about a Russian guy (Vissarion) who claims to be Jesus reincarnated. There are three things that make him interesting. (1) He actually has a following, about 5,000 dedicated disciples. (2) He is gathering his people in a plot of land and building a community. (3) Even though he seems to exercise the authority of the beast he appears to have good intentions to prepare a people for calamities to come. (4) He has taken a desolate area in Siberia and turned it in to a beautiful and productive food producing community. Not quite a Garden of Eden but very nice considering the circumstances. DK made the prediction that a beautiful new religion would come out of Russia so I always check out any movement that seems to be afoot there. This group, despite its faults, is a possibility. That said here are some of the negatives. (1) A beastly control over peoples lives. Inhabitants have to rise at a certain hour. Do prayers and then go to work. Their diet is regulated and they must be vegetarians. They feel the need to ask their guru for permission for all kinds of mundane things. They basically give up most worldly things. (2) Most sell everything they have and give it to the guru and if they leave it appears they get no money back. I’m not positive of this but indications point in this direction. (3) Though he claims to be Jesus he is not much like him. He performs no miracles and does not teach like him in profound words and parables. I believe that he really thinks he is Jesus but do not believe he is. (His book) was extremely detailed: it contained God’s opinion on whether or not you should always wipe your feet when coming indoors, for example. The community also aimed to return to 18th century levels of technology, in spite of their enthusiastic embrace of the Internet and mobile phones- a contradiction surely, but then what faith is without contradictions? Ruth: He looks like another Chris Nemelka! JJ I noticed that resemblance also. He seems to be a nicer guy though. John C If she doesn’t understand his feelings, how can she claim that he is not communicating them “well”? What does “well” mean? From an emotional viewpoint, “well” could mean “I don’t feel good about the way he expresses his feelings.” From a mental viewpoint, “well” could mean “Given the current situation, observing his body language, and listening to his words, and trying to empathize with him, his words do not accurately reflect what I think he is apparently feeling.” There is a 98% chance that both of them are speaking from the plane of the emotions, so neither side is trustworthy. It’s like insanity trying to explain itself. JJ Yes, most men and women are polarized on the emotional plane and because they see emotion through different filters they often have major problems in understanding each other. This is an eternal source of good comedy and philosophy. John Gray certainly capitalized on this through his books on the idea that Men are from Mars and Women are from Venus. Here are several links that look into the emotional differences between men and women. Men and women do think differently, at least where the anatomy of the brain is concerned, according to a new study. Men can’t read women’s emotions, study confirms. Dean: Maybe I need to make it more obvious since you don’t seem to get it still. When someone talks about past lives they are effectively going into the realm of parallel universes. JJ I’ve seen a lot of ideas on past lives but this is a new one. Did you think this up on your own? Our recent past lives did not take place on a parallel universe but in this universe on planet earth. Sure you can argue with someone who claims to be some great one in a past life. If they show no evidence of greatness in this life then why should we consider they could have more intelligence and talent in the past then the present? Okay Dean, your major point has finally sunk in. You agree with very little I say and do not think I even deserve to teach anything in this or any other forum because you don’t think I know what I’m talking about and that I’m leading people astray. Your mission is to examine with a jaundice eye every word I write and then do all in your power to discredit me. I’ve given you lots of rope to attempt this over the years but you’ve reached the point where you are a boring distraction. I won’t ban you from the list but will place you on moderation. From now all all that will get through will be posts that will have some semblance of interest to the group and are non destructive in nature. Hopefully you can find another teacher that you can truly respect. Wow, I had a dream like an Alice in Wonderland travail that was quite astounding last night. The dream was definitely an apocalyptic mega-drama. I have these types of dreams before but his one was like being in a video game with different scenes going up and down elevators, into fountains, sliding doors skywalks and underground tunnels in an exquisite city built of small tiles and mosaics. It was like being on a never-ending Disney world adventure-ride. I understood that a huge monster was awakened and coming to destroy everything and there was no escape for anyone. Only a few of us knew it was coming and we were all looking for the secret “key” and the secret doorways and tunnels to the underground shelter(s). It seems I have invested in the secret underground shelter and I was trying to get the underground shelter before panic set-out for everyone. At some point I found the secret “key” which was an odd-looking thing that looked more like a tiny flash-drive electronic device. Days of Noah’ because more people than not are now calling good evil and evil good. This is the “sign” that the time for Chris’s return in imminent and that the other “signs” will follow. The marked hallmark of these days to come will be the fact that few will be able to keep their heads about themselves and the “key” to survival will be those who are able to “keep their heads about them”. This means those who do not fall into illusion and delusional thinking and do not succumb to fowling along in the panic and angst and finger-pointing. Personally, I think the tribulations will not be global and wide-spread as much as such rapidity and common-placeness of these events to come will cause mass panic which will be more the problem than the actual events. Like this Boston bombing(s) that recently took place was handled well by the first-responders, the media, and the governmental agencies into a fruitful and quick conclusion. However, the majority have misconstrued and distorted the real events for the sake of personal investment into conspiratorial theories and the hoarding of gold and supplies and just downright pride over knowing or being in the know even if the “knowing ” is a bunch of hogwash. The actual problem will not be the crises that occur but the people who choose to run amok and spread false rumors and gossip and misalignment by calling good evil and evil good. The problems that ensue will be more due to this condition of humanity and the availability of communication methods able to spread delusion and illusion and panic and not the actual events themselves which the world would be able to handle if it stayed calm by beseeching God and common faiths and worked together and joined forces and stood strong together. Those who are able to stay out of illusion and delusion and cling to reasonability conscience will be fine and will stick together and not be caught up in the flood of disinformation and rumor-mongering. JJ Like I said, you made some good comments. Here’s an additional possibility. Notice that the monster is already here, but just awakened and when awakened he becomes dangerous. Perhaps this monster is the Beast of Revelation that I have written so much on. We’ve always had the Beast here but because of our Constitution he has not been able to exercise his full power. We are in danger of restrictions on him being removed so he can awaken and become a threat to our freedoms. (1) A real physical location that will be a refuge from the Beast. (2) An underground system of communication that must be set up that cannot be detected by the authorities. Passing around actual thumb drives in secret could be a communication key. They are actually doing this in some areas where there is a tyrannical government. (3) Underground tunnels in dreams can indicate a consciousness that is not available to the masses. Let us hope the Beast will sleep a while longer until the lights are prepared to deal with it. A few weeks ago I posted the thought that Obama might be the last President of the United States. I was surprised when others searched the internet and found others who have said the same. Anyway, the other night on coast to coast the infamous Ed Dames made the same claim that Obama will be the last President of the United States. Now I find this article claiming the same. There seems to be something in the collective consciousness spewing this thought form. Only time will tell if this outrageous prediction has any substance. Whether it does or not – I am convinced that man in the White House is no friend of the Republic. JJ I don’t see Obama becoming a dictator though following a natural course of events. For one thing, I don’t see Congress cooperating in disarming citizens which would be necessary for a dictatorship to surface. It would be possible though if a major even or crisis materialized. Such triggers could be a major economic collapse or a nuclear attack on us. Even one nuclear bomb going off could create a great danger that could lead to dictatorship with someone like Obama in charge. I recall that during the days of Nixon that there were many predictions afloat that he would be the last president. Sometimes there is just a thoughtform afloat that many pick up on. On the other hand, there are times when true disaster is possible. Greer, who has recently published a paper on the latest scientific findings related to the humanoid, said that the specimen is an actual organism and not a hoax. According to him, the world’s foremost skeletal expert has determined that, despite its diminutive size, the entity was actually six to eight years old when it died. Stanford University professor Dr. Garry Nolan joined the conversation in the latter half of the first hour to share his thoughts on the Atacama humanoid. While he acknowledged that it is “very, very, very likely to be human,” Nolan conceded that the findings so far have presented unique paradoxes which prevent making that determination with any certainty. Keith: I get the feeling (astral) ‘Something Wicked Comes this Way’. Another astral feeling I keep getting is the ‘Sword of Damocles’ hanging over us all just waiting to fall. JJ I’ve felt that way for some time. Hopefully our luck will hold out until 2025. Unfortunately, there is no guarantee.